…. “We hope that our demands, as the Syrian opposition, become the demands of the Arab League and that the group then backs us up at the U.N.,” said Bassma Kodmani, a spokeswoman for the Syrian National Council, an opposition coalition. The council has called for an international mandate for civilian protection in Syria,……… ………. “We have to find out a way to stabilize Syria,” he said. “We have to find a way to satisfy the needs of the people. We hope there is a no military intervention.”…. Mr. Assad, meanwhile, brushed off the international pressure and renewed his government’s warnings against foreign interference in Syria’s crisis. “Syria is the hub now in this region. It is the fault line, and if you play with the ground you will cause an earthquake,”…. Syrian activists said they weren’t surprised with Mr. Assad’s characteristic confidence. Protests have outstripped the government’s control in just a few instances in the uprising so far, including a month-long hiatus of military presence from the city of Hama in the summer that was later met with a renewed regime attack. Some analysts say government forces have been able to control—but not contain—protests, …. At least 60 civilians have been killed in Syria since Friday, according to activist network the Local Coordination Committees, making it the deadliest weekend since May. Protesters appeared to retreat on Sunday, but still, activists reported eight antigovernment protesters were killed by security forces. The weekend violence was concentrated in Homs, Syria’s third-largest city, and a larger province of the same name that has hosted a growing base of dissident soldiers fighting the army. 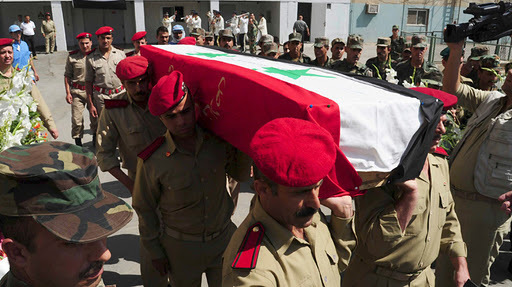 On Saturday, 20 soldiers were killed and a further 53 injured in fighting between the army and “what is presumed to be defected soldiers,” according to the U.K.-based Syrian Observatory for Human Rights. Syrians disagree on whether the incipient armed revolt in places like Homs is led largely by dissident soldiers or by civilians taking up arms. Mohammed Saleh, a resident of Homs, said tanks sprayed machine-gun fire at homes in a central neighborhood—including his own—throughout the weekend as troops fought what Mr. Saleh described as groups of armed civilians. The groups destroyed four military armored personnel carriers, he said. Last week, massive crowds gathered in several cities, including Damascus, to pledge their loyalty to Mr. Assad. Syria’s state television, broadcasting scenes of crowds chanting “The people want Bashar al-Assad,” said some two million people gathered at the capital’s Ummayad Square last Wednesday. It broadcast fresh scenes of a loyalist demonstration in the southern city of Suweida on Sunday. “At one point, what we call the silent majority came to be aligned with the street protests at least from a humanitarian and moral point of view. But now they’ve stepped back again,” Mr. Hussein said.